This article is about the level in Super Mario World. For the second Yoshi's Island game, see Yoshi's Island DS. Yoshi's Island 2 is the second level on Yoshi's Island in Super Mario World. Finishing the level is compulsory for beating the game, since Yoshi's Island 1 could be avoided. The level introduces many reoccurring elements, such as Yoshi, Monty Moles, Koopa Troopas, Berries, and Beanstalks. The level has a forest theme. At the beginning of the level, a red Berry can be seen; Berries are typical of this level. Soon after, there is a Red Shell on the ground which can be thrown into a series of Koopa Troopas on a plateau, providing the player with many points and finally an extra life. There are two ? Blocks ahead and, given that the player already has beaten the Yellow Switch Palace, a yellow ! Block containing a Super Mushroom. The next pair of ? Blocks not only contains a Coin, but also Yoshi. When proceeding, the player comes across a Message Block giving information about the Spin Jump. There are also some more red Berries here that Yoshi can eat. 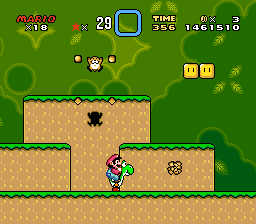 After defeating a red-shelled Koopa Troopa and a Koopa without a Shell, the player can easily reach the first Dragon Coin, surrounded by some regular Coins. When continuing, another Koopa without a Shell can be seen about to step into a Green Shell. Yoshi's abilities make it easy to defeat those. The second Dragon Coin can be found here as well. After going up some steps, the player is attacked by a Chargin' Chuck who protects the third Dragon Coin. A Message Block right before the Midway Gate describes the function of the same. After two yellow Warp Pipes, a ? Block provides a second chance to get Yoshi in this level, or a 1-Up Mushroom if Yoshi is already there. New enemies, Monty Moles, are introduced after this. The right Rotating Block here releases a Beanstalk. Climbing up gives the player access to a row of clouds and the fourth Dragon Coin (Yoshi cannot go up the Beanstalk). The final Dragon Coin can be found just afterwards back on the ground, after another Monty Mole. When eating the next Berry, Yoshi releases a Super Mushroom, given that he has eaten all the other Berries in the level. There is also a pink Berry right next to it. The player can slip into the blue Warp Pipe ahead, taking them to an underground room with six winged ? Blocks and four Grab Blocks. Mario and Luigi can Double Jump off Yoshi to reach the ? Blocks, or they can throw the Grab Blocks. They all contain Coins, except for one which contains a 1-Up Mushroom. When leaving the underground room through the green Pipe, the player finds himself or herself right next to a Warp Pipe with a Jumping Piranha Plant inside. After this, a P Switch surrounded by Rotating Blocks can be seen. Hitting the lower central Block makes the Switch Block drop, and hitting the Switch Block turns the Coins to the right into solid Blocks. The player now can walk right onto the Blocks and thus avoid the Chargin' Chuck below and reach a high score at the Giant Gate. This page was last edited on April 21, 2019, at 13:57.